Prepare glaze by simmering vinegar in a small saucepan over medium-high heat until reduced by half. Set aside. According to the recipe, this should take 7-9 minutes but I found it took quite a bit longer. Now I use the balsamic glaze mentioned in the description. Prepare the filling by whisking (or beating with a mixer) the cream cheese until smooth. Add artichokes, onion and basil to cream cheese and mix well. To assemble rolls, lay a sheet of plastic wrap on work surface. Arrange four slices of prosciutto vertically on plastic wrap, overlapping slightly to form a 9 inch square. Spread 1/3 cup of artichoke filling over prosciutto. Top with 1/2 cup of arugula (you could substitute romaine cut in thin strips). 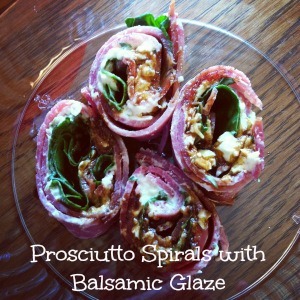 Starting at the side closest to you, tightly roll up prosciutto and fillings like a jelly-roll or a sushi roll. Wrap up in the plastic wrap; refrigerate until ready to serve. Repeat 3 more times for a total of 4 rolls. To serve, remove each roll from plastic wrap and slice into 12 spirals for a total of 48 rolls. Place on serving platter and drizzle with glaze. Thank you very much for this recipe, I am printing it and will be using it soon.